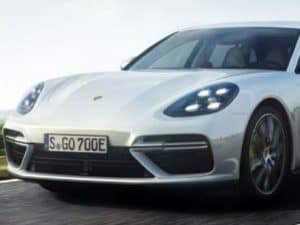 Porsche is expanding its hybrid range by adding a powerful plug-in hybrid to the Panamera Sport Turismo model line. Combining the 4.0-liter V8 engine from the Panamera Turbo Sport Turismo with an electric motor, the 2018 Panamera Turbo S E-Hybrid Sport Turismo delivers a total output of 680 hp and 626 lb.-ft. of torque, making it one of the most powerful production vehicles Porsche has ever made. But it is not just power that makes the Panamera Turbo S EHybrid Sport Turismo unique in its segment. Its concept, including a large tailgate, low loading edge, increased luggage compartment volume and seating for five means that the new flagship of the model line offers a high degree of everyday practicality. Like the Panamera Turbo S E-Hybrid sedan, the Panamera Turbo S E-Hybrid Sport Turismo offers a compelling demonstration of the performance advantages of hybrid technology. The new Panamera Turbo S E-Hybrid Sport Turismo utilizes a boost strategy derived from the 918 Spyder and combines a 136 hp electric motor with a 550 hp twin-turbo V8 engine. Total output of the combined systems is 680 horsepower and 626 lb.-ft. of torque. The decoupler installed in the Porsche hybrid module is actuated electromechanically by an electric clutch actuator (ECA), just like in the other current Panamera hybrid models. This ensures quick response and exceptional comfort. Like other Panamera models, the quick-shifting eight-speed Porsche Doppelkupplung (PDK) dual-clutch transmission sends power to the standard active all-wheel drive system with Porsche Traction Management (PTM). The E-performance powertrain allows the vehicle to sprint from zero to 60 miles per hour in 3.2 seconds and complete the quarter mile in 11.6 seconds. The top track speed is 192 mph. The electric motor is powered via a liquid-cooled lithium-ion battery with an energy capacity of 14.1 kWh. The high-voltage battery takes 12 hours to fully charge via a common 120 V, 10 amp connection. If the optional 7.2 kW on-board charger is utilized instead of the standard 3.6 kW unit, the charging time decreases to less than three hours with a 240 V, 40 amp connection. Charging can also be initiated using a timer via Porsche Communication Management (PCM) or the Porsche Connect app (for smartphones and Apple Watch). Additionally, the Panamera Turbo S E-Hybrid is fitted with auxiliary air conditioning to cool or heat the passenger compartment prior to driving. The Turbo S E-Hybrid Sport Turismo offers all of the innovations of the second generation Panamera. These include the digitalized Porsche Advanced Cockpit, groundbreaking assistance system options such as Porsche InnoDrive including adaptive cruise control and optional rearaxle steering. At the top of the vehicle, the roof extends into an adaptive spoiler. The angle of the roof spoiler is set in three stages depending on the driving situation and selected vehicle settings, and can generate an additional downforce on the rear axle. In normal driving, the aerodynamic guide element – a central system component of Porsche Active Aerodynamics (PAA) – stays in its retracted position with an angle of minus seven degrees, which reduces drag and thus optimizes fuel consumption.